Well, the day is getting closer. I leave next Monday. I can hardly believe that this is all really happening! You cannot imagine how excited I am! Sunday I got some things I needed for my trip, including a suitcase (of the giant, purple variety). Realizing I'll be gone for an entirety of nearly 40 days, I'm very glad we can do laundry at the hostel ISM has for us! Next Monday evening, June 25, I will be flying out of Denver International Airport. I will arrive in Iceland early the next morning where I have a layover a little over an hour. I should arrive in London around 11am local time on June 26. I'll stay there for a few days, and leave to Vilnius on the afternoon of Friday, June 29. Yesterday I booked my return flights. I will have to get to St. Louis when I return, not just back to Denver. I'll be staying in Vilnius an extra week for their youth camp (July 23-27), which Shasta Miller, the missionary's wife, told me about. However, I can't stay for the entire thing. I'm involved in Bible Quizzing with my church, and I absolutely love it. There is an age limit, so this year is my last. We are going to Nationals in St. Louis, Missouri, and the orientation is on July 28. My team is predictably driving there, so they'll be leaving a day before orientation. Fortunately, I found a way around this potential complication. When I searched, the cheapest one way flight to St. Louis from Vilnius on July 28 was over $1200, and on July 25-27, prices weren't much better. This was not ideal, so I did a bit more looking around. I will be flying back from Vilnius to New York, and I have about a 7 hour layover in Ukraine. I'll be leaving Vilnius the morning of Thursday, July 26, and arriving in New York that evening. I'll stay there that night, have a day in New York, and then fly to St. Louis the morning of Saturday, July 28. I should arrive in St. Louis around 1pm, on time for orientation and everything. Surprisingly, going this way, even with staying in New York for two nights, will be between $400 and $500 cheaper than that original $1200 I found. Plus, I get a day in New York on the way back! Who wouldn't be okay with that? Nationals will last a few days in St. Louis, then I'll drive back to Denver with my Bible Quizzing team. 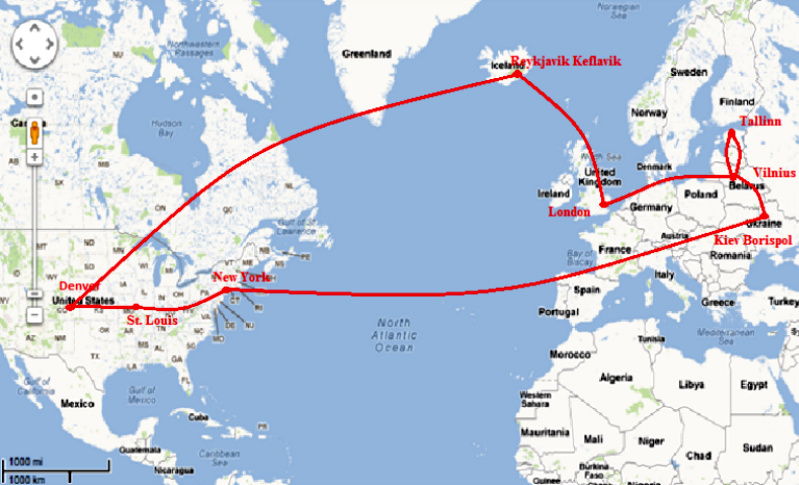 So now you all have an idea of my itinerary.